Blood Transfusion Claims – How Much Compensation Can I Claim? We often think of blood transfusions as life-saving procedures that occurs only to the most poorly patients in the worst circumstances. And whilst they undoubtedly do save lives they are not without dangers of their own. Thankfully wrong blood transfusion cases are rare but have you ever considered what would happen if someone received the wrong Rh factor? Or if a patient has type B blood, if they received a transfusion of type AB blood what would happen? The answer is you would undergo an abo incompatibility reaction or hemolytic transfusion caused by your blood attacking the incompatible blood. Blood is sorted into four types – A, B, AB and O and can also be classified as Rh Positive or Rh Negative. Blood that does not match your blood type will be rejected by your body. So it is important to know if you have type A blood which types of blood can you safely be transfused with. We also expect that a blood transfusion will provide us with clean blood. But by reading about contaminated blood news we learn that sometimes people are unwittingly given blood diseases by blood transfusion. Naturally there is compensation for blood transfusion that results in conditions caused by contamination. There is an infected blood payment scheme administered by the Government if you received at transfusion before September 1991. This is not only a Hep C compensation fund – it covers those affected by HIV as well. It is mainly intended to provide victims of the tainted blood scandal compensation who received blood products in the 1970s and 1980s. In the 1970s the NHS imported quantities of blood products known as Factor VIII and Factor IX. The contaminated blood news reports indicate that it was caused by unsafe manufacturing practices, meaning that one infected individual could infect as many as 60,000 other donations in the same batch. No individual organisation admitted responsibility and the UK Government created a fund to help with the living costs of those affected. The Contaminated Blood Compensation latest news is that this fund was overhauled in 2016 following widespread calls for reform. Compensation for contaminated blood victims also includes those affected with other blood borne diseases such as vCJD. This contaminated blood latest scandal affects only a small handful of people and procedures are in place to prevent further infections. What kind of blood transfusion compensation claims can be lodged? Compensation for Blood Transfusion is a difficult issue. Patients who are receiving blood transfusions are often seriously ill so it is necessary to be sure that the blood transfusion is to blame. Wrong blood transfusion cases and compensation for contaminated blood victims are the most common types of claim. 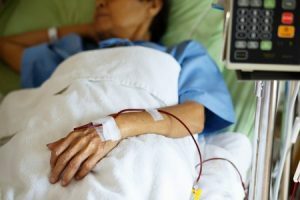 Having an incompatible blood transfusion is what caused Mr A to lodge a compensation for blood transfusion claim against Middlesex University Hospital. What would happen if someone received the wrong Rh factor? Unfortunately for Mr A this is exactly what happened to him. Mr A suffers from Sickle Cell Anaemia which requires regular blood transfusions to treat. On the occasion in question he was transfused with 3 units of group B Rh- blood when he is of blood type o Rh+. Mr A’s body identified the antibodies in the transfused blood as foreign and started attacking it. Mr A suffered severe pain, tremors, vomiting, fever and a burning sensation. He drifted in and out of consciousness before the transfusion was halted and the error noticed. Mr A required transfer to the Intensive Care Unit at University College Hospital, London for remedial treatment. Although he has made a gradual recovery from his physical symptoms his underlying anaemia is a life-long condition that requires further transfusions. Mr A now suffers from psychiatric problems which affect him day to day, and extreme anxiety when faced with the prospect of another transfusion. His claim is still progressing. Why does compensation for blood transfusion vary? You can claim for contaminated blood compensation, incorrect transfusion (for example if a patient has type b blood, if they received a transfusion of type ab blood what would happen), if they have been given a transfusion without consent or unnecessarily. The effects of each event vary so the level of compensation is calculated according to how badly affect you have been by the action. If you think you have been affected by a blood transfusion, whether you are looking for tainted blood scandal compensation or believe you didn’t give permission for a transfusion you should take legal advice before proceeding. Depending on the nature of your claim you may simply need to fill in some forms to be eligible for a payout – for example from a Hep C compensation fund. Negligence claims will need investigating and may well show up a deficiency in the system. In the case of Mr A it was discovered that two other transfusions had occurred where blood of the wrong type had been given. It was also discovered that an automated warning had been over-ridden and nurses had not fully followed procedures that should have ensured his safety. Talking to us is completely free. If we think you have a valid claim we will take on your case at no cost to yourself – all the legal fees will be included in the claim meaning you will never be out of pocket. So what have you got to lose? Call us now on 0800 073 8804 or use our online chat to speak to a legal expert with over 30 years of experience in compensation claims today. Whether you’re seeking compensation for blood transfusion errors, or just want to learn more about transfusion, this site should help. The Infected blood payment scheme details can be found here. If you would like to keep up to date with developments on contaminated blood compensation, read above. This guide pertaining to medical negligence could help if you are looking for compensation for blood transfusion error.